Peerz Academy has launched an online education platform to facilitate peer-to-peer mentoring to students across the North East who require additional academic support. 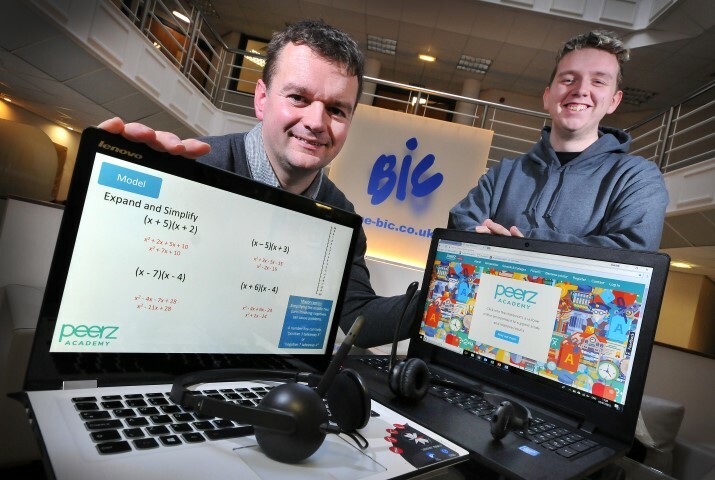 Founded by former teacher Wayne Harrison, Peerz Academy was funded by the North East Business and Innovation Centre’s (BIC) Innovation Programme and has already recruited four new employees. “The aim of Peerz Academy is to improve learning opportunities and boost GCSE success rates in the North East providing affordable access to peer mentors in a secure online learning environment. “Evidence shows that peer-to-peer tuition can be just as effective as one-to-one private tuition, but more cost effective. Peerz lessons are only £7.50 for one hour support, compared to £25 – £35 for private tuition. “The lesson content is created by experienced teachers, but the mentoring is delivered online by verified peer mentors. The mentors are successful university and college students who have performed well in their GCSE’s and want to earn an income or credits which they can then use to pay for mentoring themselves. The Innovation Programme provides grant funding for the creation of unique products, services and processes, boosting innovation potential in the region, and accelerating the growth of ambitious companies. “Gillian Middleton (innovation adviser) at the BIC was brilliant. The grant application process was straightforward and Gillian answered any questions we had. The funding enabled us to create a prototype which allowed for testing and development, as well as take on an apprentice who is now employed permanently in our IT department. “As a new business applying for large contracts, we needed advice about policies and also finance to rebuild the platform based on the feedback we had received. “The support we received has subsequently helped us win new contracts and to grow the business. We have also received additional funding for further developments which again has helped us to scale the business a lot quicker than expected. The North East Business and Innovation Centre (BIC) has received £820,439 of funding from the England European Regional Development Fund for the SME Innovation Programme as part of the European Structural and Investment Funds Growth Programme 2014-2020.